Sun drenched "Beverly Hills Housewife" by David Hockney (b. 1937) from the Betty Freeman Collection leads the Post War and Contemporary Art cvening sale at Christie's New York on May 13, 2009. Painted between 1966-1967 it has an estimate of $6,000,000 to $10,000,000, the highest estimate in the sale that comprises 54 lots and is expected to achieve between $71,500,000 and $104,530,000, a broad and realistic price range, and the quality of the artworks is high. The Hockney, Lot 14, a diptych and an acrylic on canvas that measures 72 by 144 inches, sold for $7,922,500 including the buyer's premium as do all results mentioned in this article. The price was a world auction record for Hockney. The auction was very successful with 49 of the 54 offered lots selling for $93,734,500, almost twice the result achieved at Sotheby's the night before (see The City Review article). After the auction, Amy Cappellazzo described the auction as "fantastic" and "very, very strong" and said that "there was very broad, deep bidding on a global level," adding, with a big smile because of the current fiscal crisis, that it "felt vaguely like a year ago" when prices were soaring. Brett Gorvy, International co-head and deputy chairman of the Contemporary Department, said that 69 percent of the buyers were American, 27 percent were European, two percent were Asian and two percent were others. "There was definitely magic in the area," he said, adding that "we had great expectations." He said that he was gratified to see that works by such artists as Jean-Michel Basquiat, Peter Doig and Andy Warhol fared well despite some recent "backlash" comments about them. Laura Paulsen, senior international director and deputy chair of the department, added that "the sale was really well textured." If the Christie's experts were a bit giddy from the "success" of the evening, so too was the crowded auction room that burst in a loud round of applause at the auction's conclusion. This sale is highlighted by works of art from the Betty Freeman Collection, a fusion of art and sculpture as extraordinary as the woman herself. 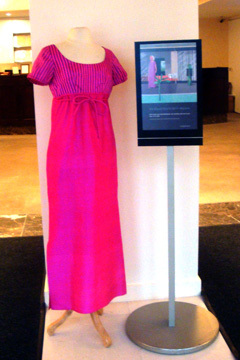 The pink dress shown here in Christie's galleries is the one she wore for her portrait in "Beverly Hills Housewife," and the bright modern house depicted behind her was an informal gallery for many artworks included in this sale, offering a glimpse into the private life of a legendary collector, who lived surrounded by the creations of her favorite artists, to be enjoyed as well as "collected." The Betty Freeman Collection is as extraordinary as the woman herself. 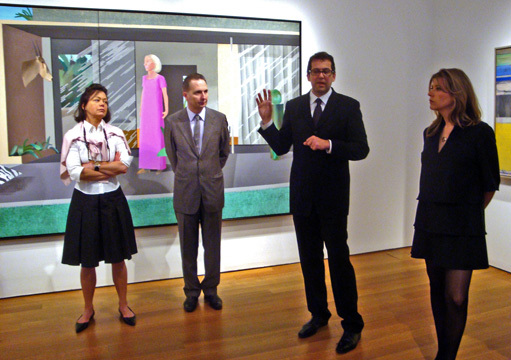 The pink dress shown here in Christie's galleries is the same one she wore for her portrait in "Beverly Hills Housewife." The bright modern house depicted behind her was an informal gallery for other works from the Betty Freeman Collection on offer at this sale, offering a nostalgic glimpse into the lifestyle of a legendary collector. 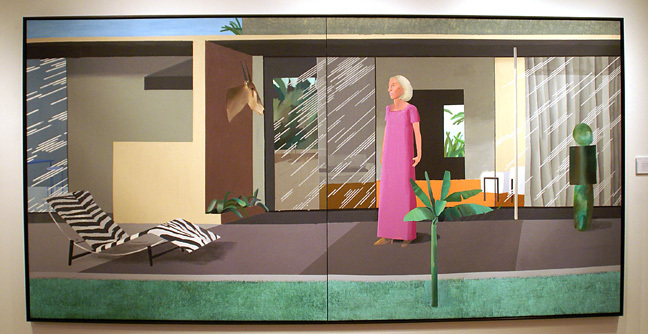 To call Betty Freeman just a "housewife" is a deliberate understatement, and no doubt she and Hockney enjoyed a good laugh over the title of the painting. A legendary "modernist" who believed wholeheartedly in the art of her time, Betty Freeman was an important benefactor of contemporary artists, and of avant-garde classical composers that are now household words - even among those that might not be fans of classical music - John Cage, Phillip Glass and John Adams to name a few. Lot 1,"Blue Goose," by Robert Wilson, who created ground breaking "Einstein On the Beach," is the first lot of the collection, and has an estimate of $15,000 to $20,000. The epically scaled Hockney dominates the sale, representing an iconic chapter in the history of contemporary art. A native of Bradford, Yorkshire, (England), Hockney fell in love with bright and beautiful California as soon as he arrived there. The place became an important catalyst and a successful subject for him - and it made him famous. He painted California's light, palm trees and shimmering swimming pools with measured detachment, now known as his "California Dreaming" series. Betty Freeman and Hockney have remained lifelong friends, and this painting is a celebration of the California lifestyle, and his patron's extraordinary vision, personality and style. Mark Porter, President of Christie's America described "Beverly Hills Housewife" as a "highly competitive consignment won by Christie's through creative marketing commitments, the expertise of its specialists, and our long-term relationships with the consignor rather than through guarantees or revenue sharing arrangements,"
"I'm always interested in the new, and don't understand why everybody isn't. I like contemporary painting, furniture, architecture. So of course I like contemporary music....I like complexity, challenge, ambiguity, abstraction" said Betty Freeman in an interview with The New York Times in 1998. Other highlights of this sale include the very fine, amorphous "Grey" by Sam Francis (1923-1994), also from the Betty Freeman Collection, that was exhibited in "Twelve Americans" at the Museum of Modern Art in 1956. It has an estimate of $2,000,000 to $3,000,000. The 1954 oil on canvas measures 119 by 75 3/4 inches and has an unusual but quite rich palette. It sold for $3,66,500. 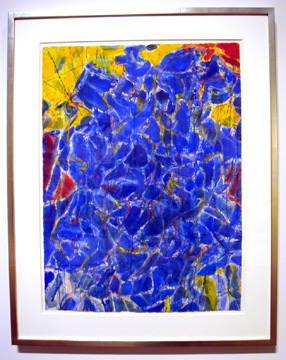 Another Francis painting from the Betty Freeman Collection is Lot 4, "Blue and Yellow," a 1954 watercolor on canvas. It measures 29 3/4 by 22 inches and has an estimate of $300,000 to $400,000. It sold for $446,500. Lot 27 is a stunning 1993 work by the contemporary artist Peter Doig (b. 1959) entitled "Night Fishing" that is reminiscent of a shimmering Joseph Mallord William Turner. An oil on canvas, it measures 79 by 98 1/2 inches. It has an estimate of $3,000,000 to $4,000,000. It sold for $4,674,500. The Doig is large and features a canoe in water, the perfect foil for mouthwatering painterly effects that capture the ever-changing virtuoso effects light enacts upon nature, a challenge that many great artists have transposed to canvas in every possible style. This romantic waterscape evokes Monet, Turner, and Caspar David Fredrich, the 19th century German Romantic painter, who has also influenced Gerhard Richter. Depicted at dusk, the canoe is on the verge of disappearing into an amorphous mist in which nothing is clearly defined except a pulsating color field. Doig's romanticism is resonating with collectors, and prices for his paintings have risen dramatically in the last few years. "Night Fishing" is a dazzling work of art that made its presence felt in a gallery packed with heavyweights of Post War and Contemporary art. 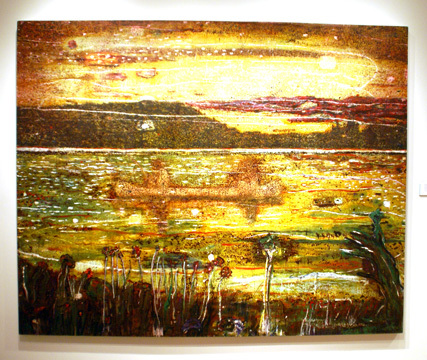 Peter Doig's subjects are often prosaic - houses, beaches, lakes - culled from film stills, film footage and photographs, which are then abstracted and transformed through a rich variety of media into imaginary, otherworldly images that are left unresolved, like "Night Fishing," where a canoe appears to be dissolving into an amorphous, pulsating color field. Tate Britain held a major retrospective of Peter Doug's work in 2008, and his romanticism is resonating with collectors, spurring a rise in prices for his work. Another bright star from the Betty Freeman Collection is Lot 6, "Frolic" by Roy Lichtenstein (1923-1997) that he happily plagiarized from a painting by Picasso, (who described himself as the best plagiarist he knew), "Baigneuse au ballon de Plage," (1932), and from his own Pop Art "Girl with Ball," which is universally recognized from the catalog of The Museum of Modern Art (both paintings are in the MoMA Collection) and which appears sporadically on everything from metro card holders sold in its gift store to museum literature. This lot has an estimate of $4,000,000 to $6,000,000. It sold for $6,018,500. 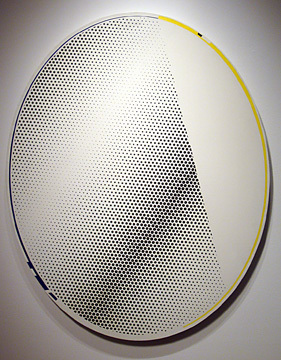 Lot 17, Roy Lichtenstein's oval "Mirror #3," is an oil and magna on canvas that measures 60 by 48 inches. It has an estimate $1,900,000 to $2,500,000. It sold for $1,650,000. 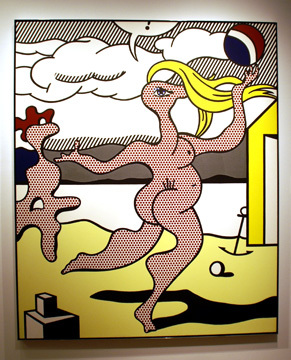 Appropriating and subverting a painting by the great Picasso was not off-limits for Lichtenstein, who "lifted" images at will from popular culture and re-worked them in his own "imitation print" paintings that were carefully rendered by hand - with a traditional paintbrush, a deliberate irony. A great and popular artist was no different to a mirror, comic book character or garish advertisement, although he did wait till after Picasso's death to take on one of his paintings as a Pop Art subject. Lot 15, "Brushstroke," by Roy Lichtenstein, is a painted and patinated bronze sculpture that measures 54 1/2 by 27 1/2 by 10 1/2 inches. It is also from the Betty Freeman Collection and has an estimate of $600,000 to $900,000. It was passed at $480,000. 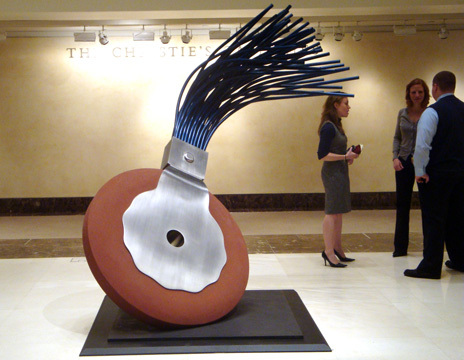 Lot 10, "Typewriter Eraser," is a painted aluminum, stainless steel, ferroconcrete and bronze sculpture by Claes Oldenburg (b. 1929). It measures 89 1/2 by 80 by 70 inches and is from the Betty Freeman Collection. It has an estimate of $1,400,000 to $1,800,000. It sold for $2,210,500, setting a new auction record for the artist. Other highlights from The Betty Freeman Collection include Lot 9, "Portrait of Man Ray," by Andy Warhol, a 1974 synthethic polymer, acrylic and silkscreen ink on canvas that measures 78 1/2 by 95 1/4 inches. It has an estimate of $2,000,000 to $4,000,000. It sold for $2,098,500. Other artists whose work Betty Freeman collected and included in this sale are Alexander Calder, Joseph Cornell, Donald Judd, Dan Flavin and Bruce Nauman. Christopher Burge, the auctioneer, in "action"
The 20 lots from the Betty Freeman Collection are estimated at $24,000,000 to $37,000,000. 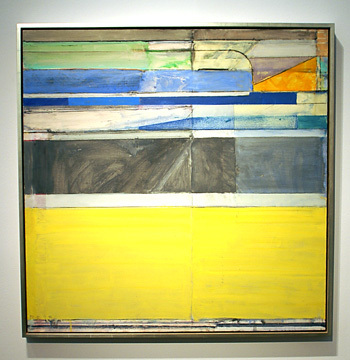 From the artist's "Ocean Park" series is Richard Diebenkorn's luminous, Lot 29, "Ocean Park No. 117," painted in 1979, is one of the best examples in the series created over a period of twenty years, its colors evoking the coast, light and topography of the location that inspired it. The 45-inch square oil, graphite and charcoal on canvas, is a sophisticated gem by Diebenkorn and has an estimate of $4,000,000 to $6,000,000. 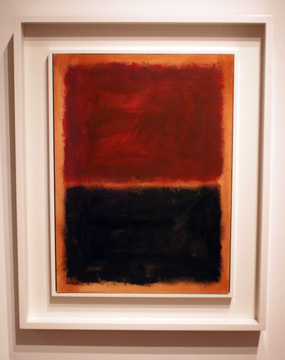 It sold for $6,578,500, just short of the artist's auction record of $6,760,000. Lot 36, "Corps de dames, la rose incarnate," by Jean Dubuffet," 1950, oil on canvas, 46 by 35 1/2 inches, Property from the Collection of Caral Gimbel Lebworth. This sale includes Lot 36, "Corps de dames, la rose incarnate," a superb Jean Dubuffet (1901-1985) from the collection of Caral Gimbel Lebworth, an accomplished equestrian and lifelong patron of the arts, who was the daughter of Bernard and Alva Gimbel, of Gimbels Department stores, once the largest store company in the world that included Saks and Co. Her third husband - after baseball star and Hall of Famer Hank Greenberg - was Joseph Lebworth, with whom she spent the last 46 years of her life, during which time their friends included Leo Castelli, William Rubin, Andy Warhol, Christo and Jean Clause, and she attended the star studded wedding of Elizabeth Taylor to Mike Todd in Acapulco. Caral Gimbel Lebworth was also on the board of Curators International, Plays for Living, and and supported The Metropolitan Museum, the Whitney, the Guggenheim, and The Museum of Modern Art. 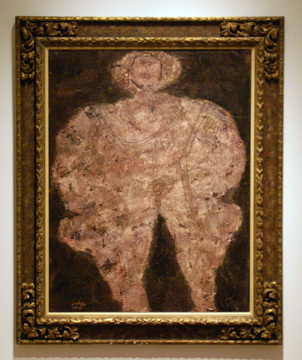 The Dubuffet is an oil on canvas that measures 46 by 35 1/2 inches and was painted in 1950. It has an estimate of $700,000 to $1,000,000. It sold for $1,762,500. 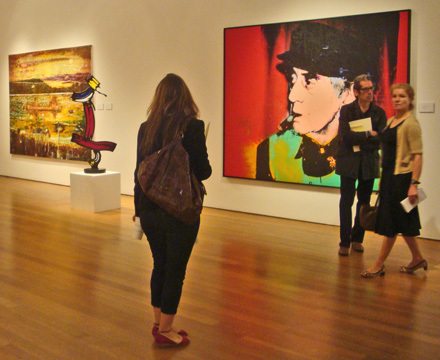 Two very different "takes" on women by heavyweights of contemporary art are illustrated here. 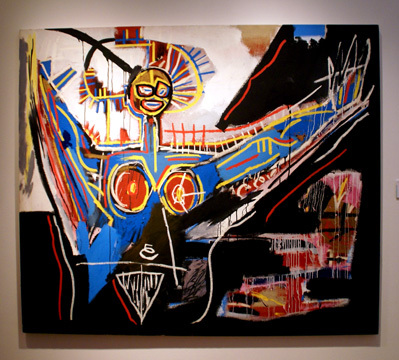 Lot 41 is a a rare depiction of a female by Jean-Michel Basquiat. 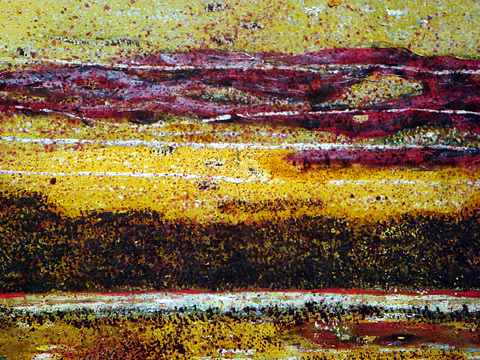 Entitled "Mater," it is an acrylic and oil stick on canvas that measures 72 by 83 inches and was executed in 1982. It has an estimate of $5,000,000 to $7,000,000 and is a portrait of his mother with whom he was close, and who encouraged his art, depicted dramatically as a martyr, with halo and outstretched arms. It sold for $5,850,500. 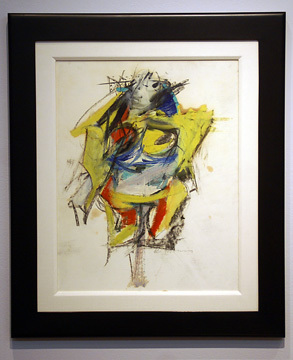 Lot 31, "Woman," is a superbly rendered 1953 work by Willem de Kooning (1904-1997) that was formerly in the collection of Evelyn Annenberg Hall. An oil, charcoal, wax crayon and graphite on paper laid down on canvas, it measures 24 by 18 1/4 inches. It has an estimate of $1,400,000 to $1,800,000. It sold for $3,666,500. Lot 32 is a 1959 untitled oil on paper laid down on board by Mark Rothko. It measures 29 7/8 by 21 7/8 inches. It has an estimate of $3,000,000 to $4,000,000. It was passed at $2,300,000. Lot 48 is a large portrait of Brigitte Bardot by Andy Warhol (1928-1987) that measures 47 by 47 1/4 inches and was executed in 1972. It has an estimate of $2,500,000 to $3,500,000. 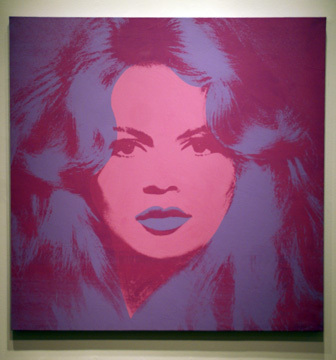 "Brigitte Bardot" is one of five paintings offered at the evening sale by Warhol. It sold for $2,770,500. One of the other Warhols, "The Last Supper,"Lot 44, is 10 feet long and was painted in 1986. It has an estimate of $4,000,000 to $6,000,000. It sold for $4,002,500. 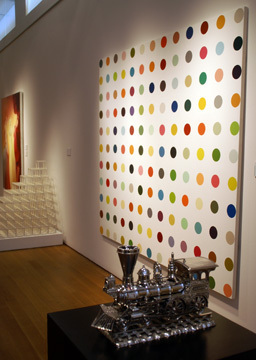 Lot 21, "Jim Beam - J.B. Turner Engine," by Jeff Koons (b. 1955), is much smaller in scale, and exquisitely crafted in stainless steel and bourbon. It has an estimate of $700,000 to $1,000,000. It sold for $2,322,500. Christopher Burge, the auctioneer, remarked that because the work contained "alcohol" it was being sold not only by Christie's but also by "Christie's Wines just to keep us legal." Hans Hoffman's "Wild Vine," Lot 30, is a dramatic and bold 72-by-60-inch oil on canvas from 1961. It has an estimate of $600,000 to $800,000. It sold for $1,202,500. 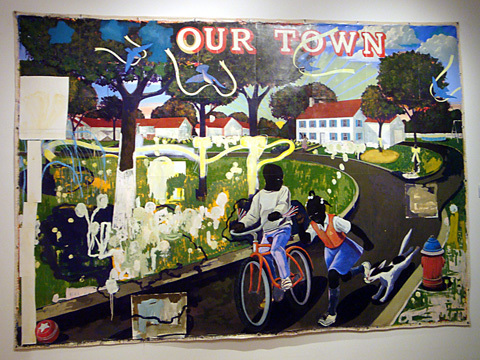 Lot 47, "Our Town," by Kerry James Marshall (b. 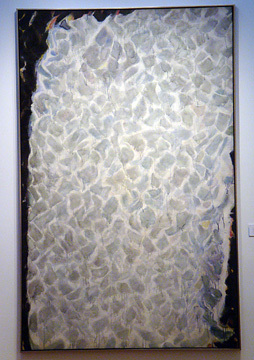 1955), is an acrylic and painted paper collage on canvas, 100 by 142 inches.It was executed in 1995. It is an intensely personal, winsome depiction of "Our Town and has an estimate of $500,000 to $700,000. 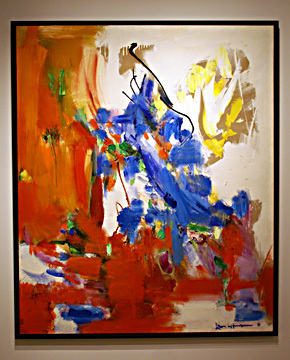 It sold for $782,500, easily shattering the artist's previous auction record of $541,000 set at Sotheby's November 15, 2007. Marshall was born in 1955 in Brimingham, Alabama, a cauldron of Civil Rights activity at the time, then moved with his family to Los Angeles when he was 8 years old, two years before the Watts Riots of 1963, which made a deep impression on him. The "blackness" of the figures in Marshall's work is deliberate - they almost melt into a void - symbolizing the "invisibility of blacks in America, and the negativity associated with "darkness." The painting references race and identity in America. This highly charged, rigorously executed canvas is as beautiful as it is socially conscious. It commands the viewer's attention in the same was as billboards and advertisements: "You still have to earn your audience's attention every time you make something," says the artist. 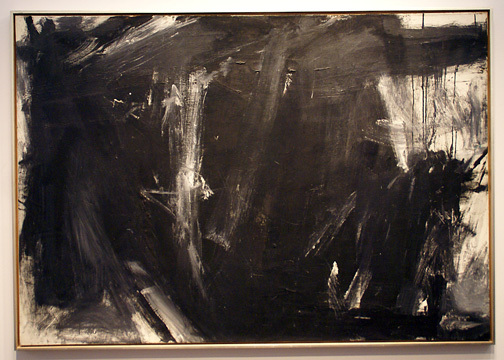 Lot 34, "Laureline," is a smoky oil on canvas by Franz Kline (1910-1962) that measures 57 by 81 inches. It was painted in 1956. It has an estimate of $3,000,000 to $5,000,000. It was passed at $1,700,000. It and Lot 32, an untitled oil on paper by Mark Rothko evoke moods, emotions and internalized landscapes. The auction has two works by Wayne Thiebaud (b. 1920). 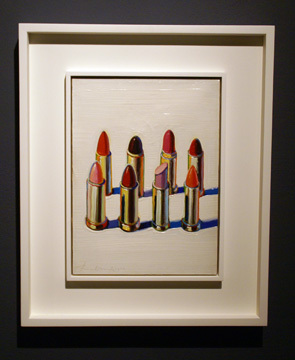 Lot 26, entitled "Lipsticks," is an oil on canvas that measures 12 by 9 inches and has an estimate of $800,000 to $1,000,000. It sold for $1,202,500. Lot 22, "Painting for Kubler," by John Baldessari (b. 1931), has been requested by the artist for his forthcoming retrospective "John Baldessari: Pure Beauty," at Tate Modern in October 2009, continuing through January 2011 at Museu d'Art Contemporani de Barcelona, Los Angeles County Museum of Art, and The Metropolitan Museum of Art in New York. It has an estimate of $1,500,000 to $2,000,000. It sold for $3,666,500. Lot 2, an untitled, 80-inch-square, vacuum-formed translucent Plexigalss and neon tubing by Douglas Wheeler (1939) has an estimate of $90,000 to $150,000. It sold for $290,500, significantly more than the artist's previous world auction recordof $78,000 set at Bonhams & Butterfields May 22, 2007. Lot 53, "Duck," a painted steel sculpture by Tony Smith (1912-1980) measures 136 by 166 by 111 inches and has an estimate of $600,000 to $800,000. 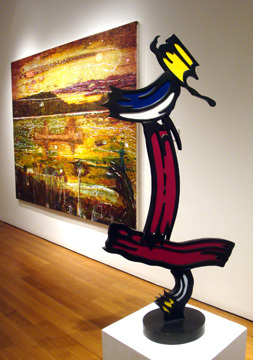 It sold for $842,500, far exceeding the artist's previous world auction record of $168,000 set a Chrisite's May 17, 2007. At the press preview Robert Manley, Co-Head of Christie's Evening Sale said: "We only looked at top quality works for this sale, and walked away from anything that was not." The quality shows in this sale.